Hello there. I went to Bulgaria for 10 days at the beginning of October to do a bit of exploring and now I'm going to tell you what I found. It was odd arriving in Sofia and getting on the metro system, only to see a poster for a snooker match between Ronnie O'Sullivan and Mark Selby but that's how the trip started. I found myself in a few places with snooker on the TV too, so there's a fact for you about modern Bulgarians: they like a bit of snooker. Another fun Bulgaria fact is that if you go into a restaurant expecting attentive service with a smile, the majority of the time you ain't getting it. That's not to say waiters are grumpy exactly, but they just care less than you might expect and aren't so fussed about getting a tip. It's oddly refreshing in some way, and was the same in Romania when I went there six years ago. 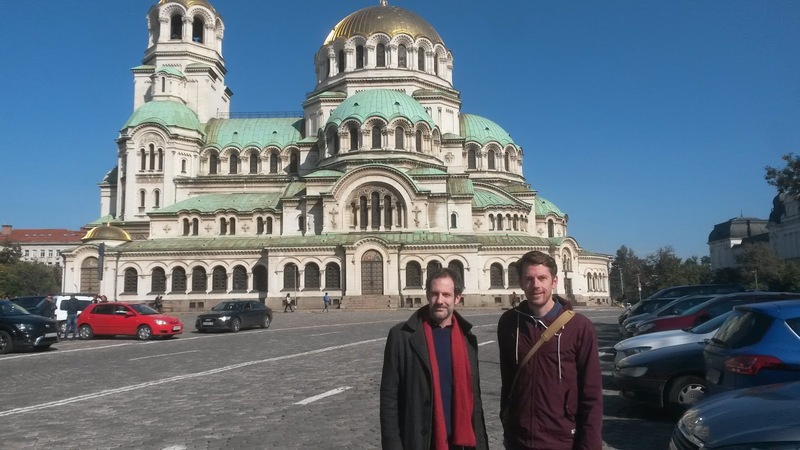 A lot of people (including Bulgarians) asked me: "why did you choose Bulgaria for a holiday?" Most of the time I said something along the lines of I'd enjoyed Romania so thought I'd give Bulgaria a go or it was a cheap place to visit from the UK or I wanted to do some hiking in the mountains. All of which were true but it's also fun to go to a country where there's a bit of a challenge involved. Bulgaria doesn't have a big tourist industry so you've got to do things for yourself and hope you'll be able to find someone who speaks English at the bus station to point you in the right direction. Which you can, most of the time. 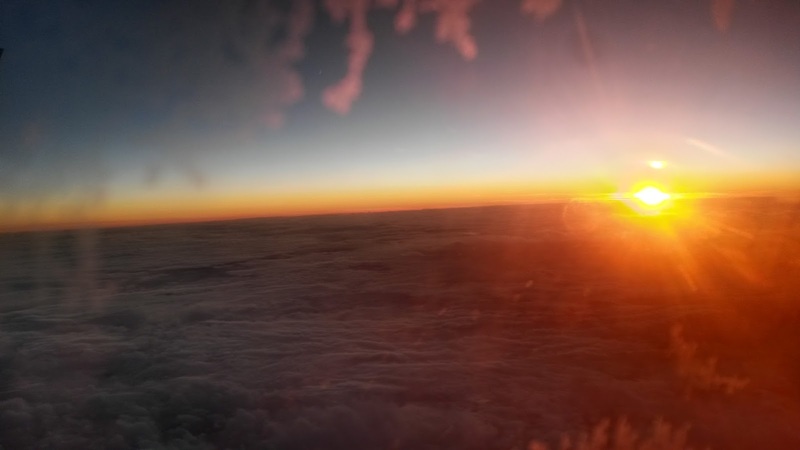 Sunset from the airplane, as I was flying to Bulgaria. Something Ryanair haven't figured out a way to charge extra for yet. Rila Monastery was built in 927 AD so it's pretty damn old. I stayed there overnight before heading off into the mountains the next day and it was one of the most peaceful places I've ever stayed at. As you'd expect from a monastery built by a hermit, I guess. They close the gates at 8pm so you have to be done in the restaurant next door before then or the monks might not let you back in. Luckily I didn't have to set off into the mountains alone but found a couple of guys from Israel going the same way. 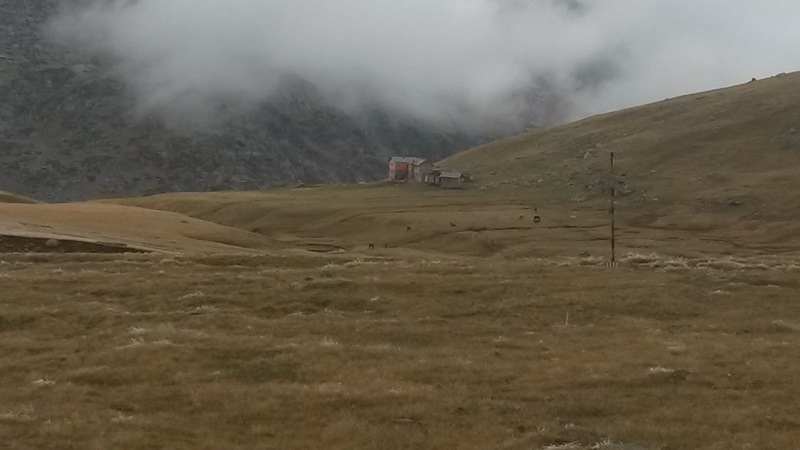 Autumn was in full effect at the lower altitudes, as you can see here. 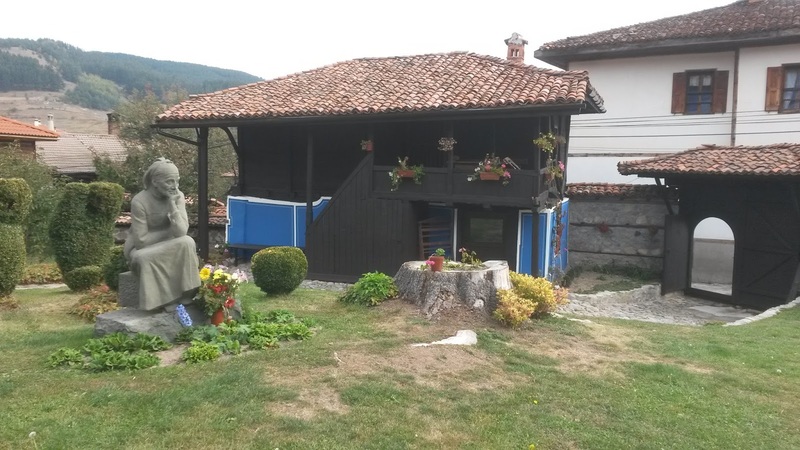 After a mostly ascending six-hour trek up Ivan Vazov, we came to the house we would be staying in for the night. I don't think I've ever stayed somewhere so remote. The only way they could get building materials there was by horse, coming up from the valley below. The menu there was concise - bean soup, bean soup or bean soup. When it snowed and clouded over the next day, visibility out the front door was about 10 metres. 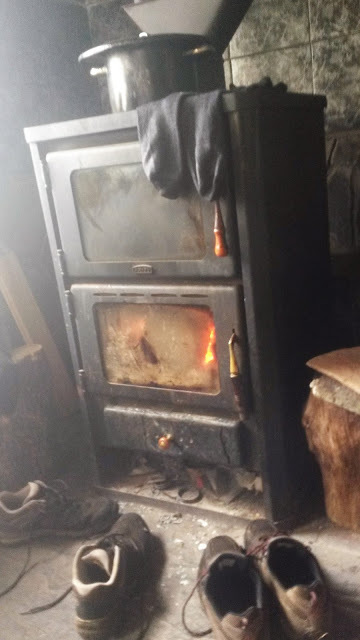 Our shoes (and my socks) were a bit damp but soon warmed up next to the wood burning stove. We thought our six hours was pretty good going until a Kiwi named Scott arrived just before dark, having powered through in about 4.5 hours. Bloody show off. He joined us on the next leg of the trip the following day. We weren't sure if the weather was going to let us leave the house the next day but we wanted to get to the Seven Lakes, so off we went. There was still a fair bit of snow on the ground up there but it wasn't too cold as long as we kept moving. When we got near the top of a mountain pass it was pretty windy. Enough for the snow on this signpost to be frozen horizontally. Oh yes, it's an eight-second video. Hit play and be transported to the Rila Mountains. Kind of. The sight that awaited us when we came down out of the clouds to see the Seven lakes was incredible. Makes a long walk worthwhile. Ofri, me and Itamal, celebrating reaching the Seven Lakes. You'll notice they look a lot better equipped for mountain hiking than me. That's because they were a lot better equipped. Big thanks to Ofri and Itamal for letting me join them for a couple of days and avoiding freezing in the mountains like Jack Nicholson in the hedge maze at the end of The Shining. Striking a manly pose on top of a mountain is what I do best. The day after the mountains, it was on to Koprivshtitsa, a small town but a crucial one in the April Uprising of 1876. You're all familiar with that uprising, I'm sure. In case you're not, it was the one when Bulgaria decided it had had enough of Ottoman rule and kicked off, with the help of Russia. A Roman amphitheatre in the old town area of Plovdiv. Built in around 97 AD and still used today. 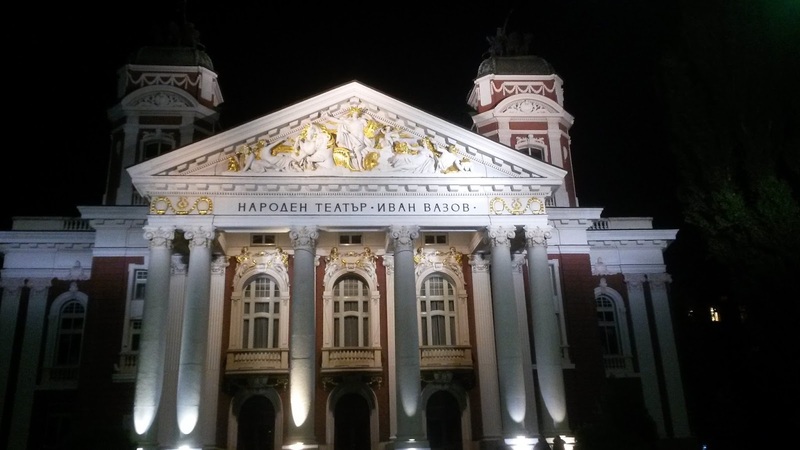 I liked Plovdiv, friendly place. After watching Bulgaria get hammered 4-1 by France in the football, I played table football with some locals and helped them drown their sporting sorrows. 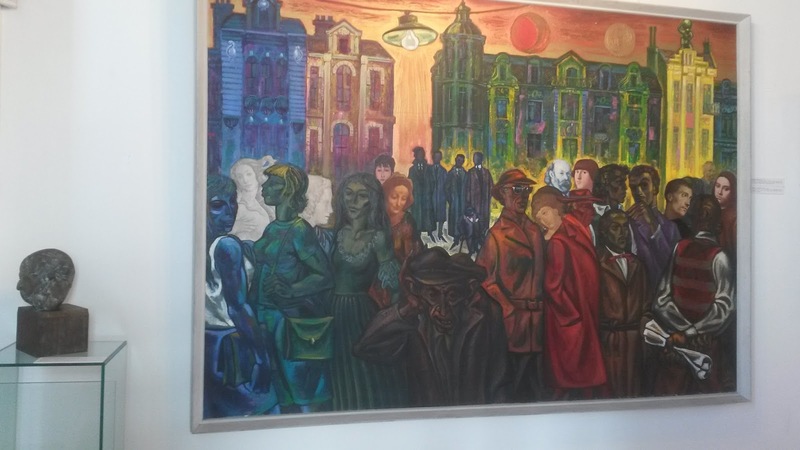 I painting of Plovdiv that I liked in the city's art gallery. Not sure what drew me to it, maybe all the pretty colours. Probably wasn't meant to be taking photos in there but that's the kind of loose cannon, reckless, don't play by the rules, maverick I am. 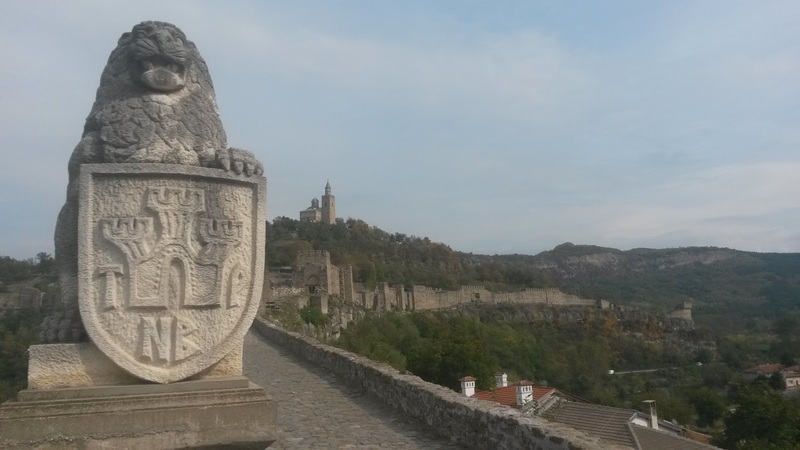 A lion guards the gates of Tsarevets Fortess in Veliko Tarnovo, northern Bulgaria. This was the next destination after Plovdiv and was a cool little mountain town/city. The fortress was built in the 12th century and was the "tsars medieval stronghold" according to history-types. 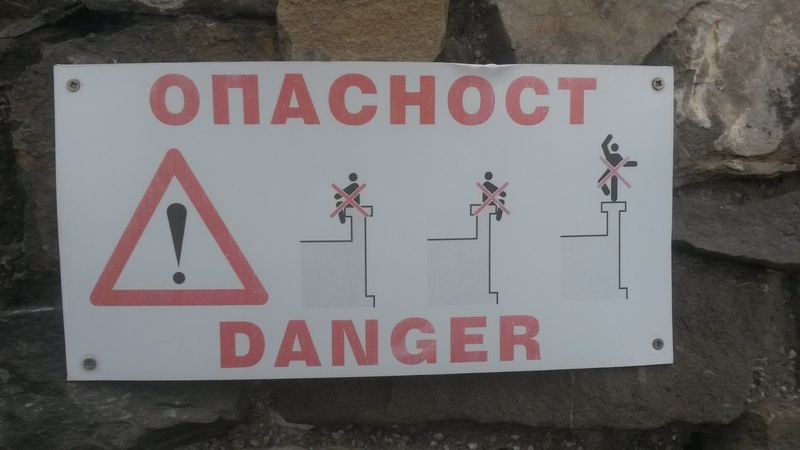 A sign on the wall of Tsarverets Fortress. No sitting forwards, no sitting backwards and no ballerinas. The day after the fortress I went on a hike to Arbanasi. Just a few hours this time and no snowy mountains involved. This photo was taken from a bridge that was roughly the starting point on the walk. Although it took me a while to figure that out because the signposting was a bit sparse. Ended up getting a bit lost and charged at by a massive junkyard dog which was luckily on a leash. 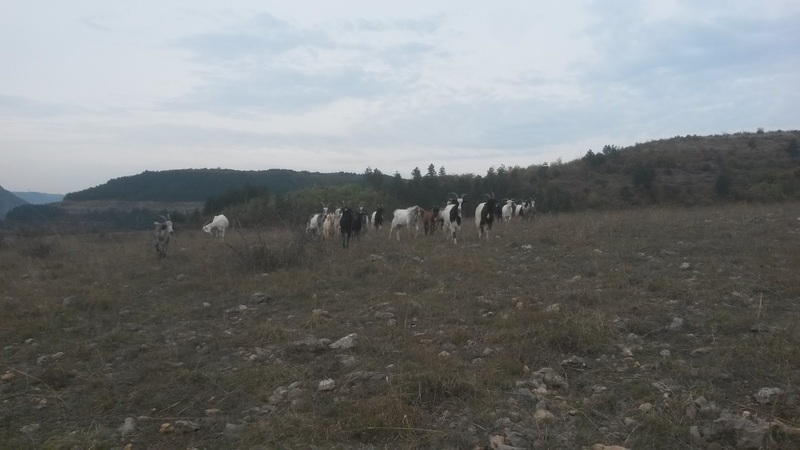 On the way to Arbanasi I got stalked by goats, as the title of this blog so intriguingly hints at. A herd of them decided to follow me. I was a bit worried that I would take them away from their shepherds so had to keep stopping, facing them and sort of waving my arms at them. Which made them stop following for a moment. Then I would turn my back and keep walking and they would follow again. It was a bit like a game of musical statues, but with goats. 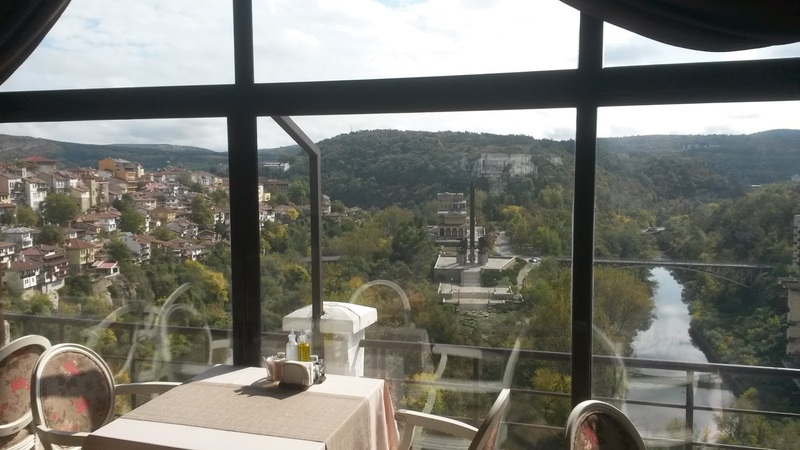 Decent view of Veliko Tarnovo from the window of a pizza restaurant called Ego on the high street. The city is built around the Yantra River, which snakes around a bit so there are quite a few dramatic backdrops like this if you have a wander. On my last night in Veliko Tarnovo I went to a bar called Melon Live Music Club with a couple of guys from the hostel I was staying in. 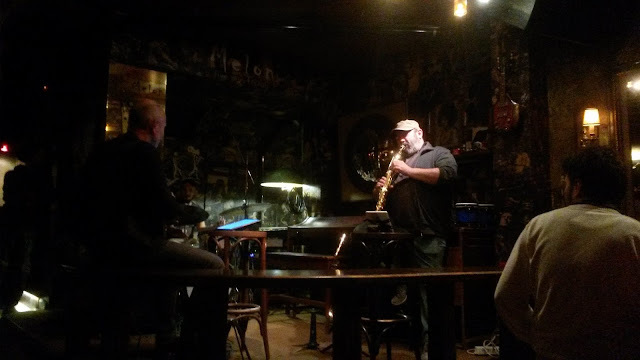 I drank some pretty good beer, the name of which now eludes me, and watched some guys play jazz. Bulgarian jazz is much like English jazz, except you can't understand what they're saying between songs. 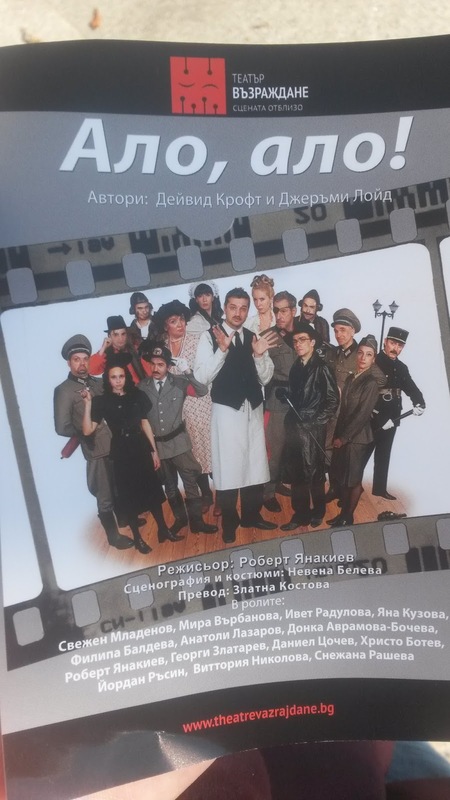 I used to love the sitcom Allo Allo when I was a kid, so it pleased me to discover a theatre was doing stage version of it in Sofia. 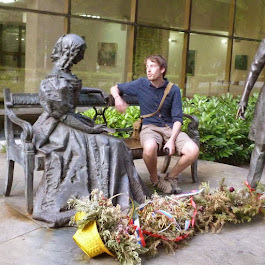 Didn't get to see it, unfortunately, but did discover that the sitcom is a still-popular favourite in Bulgaria. Ivan Vazov Theatre in Sofia. Same name as the mountain I climbed, named after a popular Bulgarian poet, novelist and playwright. 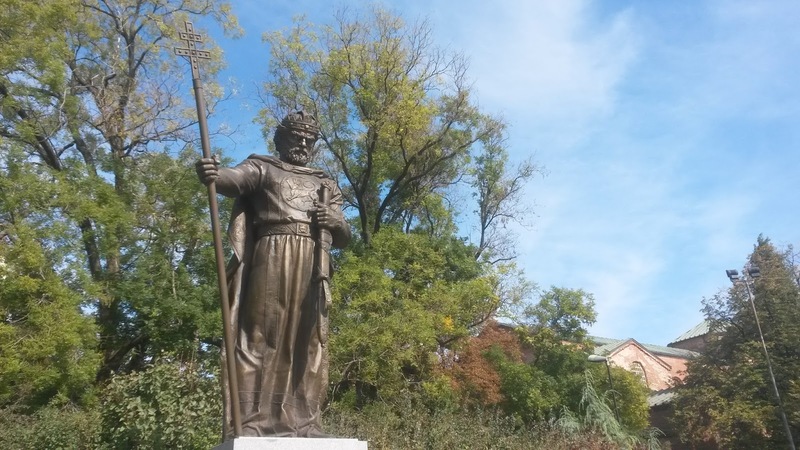 An imposing looking statue of Tsar Samuil in Sofia. He ruled Bulgaria in the 10th century and at night the eyes of this statue glow in the dark, which is probably how all great leaders wish to be commemorated. For the last couple of days of my trip, I was joined in Sofia by none other than Alastair aka The International Gentleman Traveller (IGT for short). Some say if there's a country he hasn't been to then it's probably not really a country at all. Either way, he was excellent company to end my holiday with and we went to a restaurant where there were things like 'Hooded Pheasant' and 'Rabbit killed with gun with expired shooting license' on the menu. I guess they were trying to be a bit whacky but the food was damn fine.